If you’re interested in video gaming, especially indie games, you might’ve heard of the Belgian game developer Tale of Tales. Founded by Auriea Harvey and Michaël Samyn in 2002, Tale of Tales is most widely known for its beautiful and eerie game The Path released in 2009. Their latest artistic creation, Sunset, was released in May after a very successful Kickstarter campaign and is available on Steam, along with many of Tale of Tales’ other titles. Unfortunately, Sunset only sold about 4,000 copies in its first month of release, and Auriea and Michaël have decided that they will no longer be producing video games. In a recent blog post, they outlined their economic struggles and the reasons behind their decision to no longer create commercial games. I have to admit, this news upset me, and I felt pretty sad after I read their post. I’ve been interested in Tale of Tales’ games since around 2007, when I started playing the free online multiplayer The Endless Forest. Luckily, it would seem that Auriea and Michaël plan to continue creating, albeit not commercial video games. And so, I thought I’d write a little article on my experiences playing Tale of Tales, particularly The Endless Forest. Many others have already written reviews of Sunset or written about why Tale of Tales has decided to close shop. But I simply wish to express how much I’ve enjoyed the Tale of Tales games I’ve played and how The Endless Forest has been a part of my life for the last decade or so. The game consists of a forest with a variety of places to explore and other fawns and stags to meet. It involves no verbal or written communication between players; there is no chat room or chat box or anything like that. The only sound your deer avatar can make is a sort of roar, which sounds a lot like a cow mooing. For some, the silence of The Forest may be deafening. There is no real background music or soundtrack for the game. The only music that can be played in the game requires you to dance; having your deer avatar dance results in a sot of airy, flute tune, and if you can signal the other deer around you to dance, the song can become increasingly loud and almost harmonized. For me, the ambiance created by the songs of birds and crickets singing, the click-clop of deer running through the trees, and the high-pitched sound of magic being cast always calmed me down, kind of like a rain maker app or a white noise machine. Even so, if I ever felt in need of some other kind of sound while playing The Endless Forest, I would create a playlist of forest-like music—often featuring Loreena Mckennitt and other Celtic musicians—to keep me occupied. I was probably not alone in this, and I’m sure that there were others who chose theme songs or soundtracks for their stag avatars. 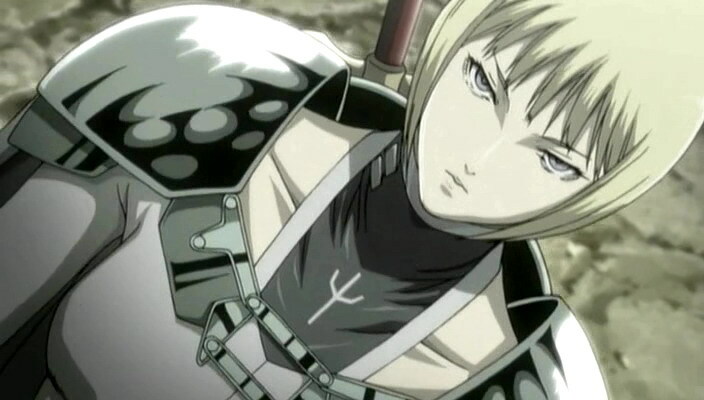 Clare and her Claymore symbol in the anime Claymore (2007). Although The Forest is fairly quiet, there are plenty of other actions you can take, however, including a number of emotes, like bowing and hopping, and the ability to cast forest magic, which really livens up the game and makes the interactions worthwhile. If you register and name your deer avatar, you can interact with certain objects in the forest and change your deer’s appearance, including their antlers, coat, and mask. But in order to do this, you must follow certain patterns, touch certain trees, and then interact with other deer. You cannot accomplish a transformation on your own, and so, this adds an interesting interactive element to the game, which would otherwise consist of mainly emotes. There’s also another special area of The Forest called De Drinkplaats where you can drink the water from a magical well and transform into a white rabbit or a black raven. When you register and name your deer, you also get to create a unique symbol that acts like a halo above your stag’s head. It reminds me a lot of the anime Claymore and how each Claymore has her own symbol that represents herself. In addition to these features, at anytime, Auriea and Michaël can use ABIOGENESIS, a mechanic in the game system that allows the makers to “play God,” so to speak, and make anything they want occur in The Endless Forest. This happens often on holidays, like on equinoxes and solstices. For instance, on Halloween, candles can be found around The Playground—a particular area in The Forest—and can be used to put candles on your deer’s antlers. It even rains or snows in The Forest! My foray into The Forest began in late 2007, during the third phase of the project. I was introduced to the game through a LiveJournal friend or community. I feel really nostalgic when I think back on LiveJournal and my earliest days exploring the Internet. If you weren’t a LiveJournal user (c. 2002 – c. 2010), then you missed out on “The Golden Age of the Internet.” Truly, it was a different place back then, with lots of small, intimate communities of people sharing their interests, thoughts, and feelings in a safe and closed environment. LiveJournal was particularly important during my adolescence, but also in my early 20s when I encountered The Endless Forest. The Pre-Raphaelite painting The Lady Clare by John William Waterhouse (1900) (oil on canvas). The game really appealed to me for a number of reasons, but it can be difficult for me to explain why. I remember when I first showed the game to my partner; I think he laughed and asked me why I would play such a strange game with no real purpose or goal. I’m not sure if he understands why it still appeals to me now, but I think he realizes that it somehow satisfies my quiet and elusive inner-child, a lot like when I rewatch The Secret Garden or reread Anne of Green Gables. It delights some whimsical aesthetic I secretly and inwardly admire and wish I could outwardly express, a whimsical inner aesthetic that longs to wear flowing white dress, collect sacred stones, cast magical circles of protection, and join a local coven. It inspires a feeling deep inside me that wishes I could set aside all of my skepticism and doubt and believe in magic and frolic in the forest barefoot. The Endless Forest just really appeals to my Princess Mononoke-loving, period film-watching, Pre-Raphaelite-admiring, tarot card-reading spirited side. The last time I played The Endless Forest and joined in a community event was a few years ago on Halloween. Out of the blue, I popped on the community forums and read that a fellow Forester had organized an in-game parade. The forums, by the way, are the only means in which people can talk to one another. Community members share a variety of communications on the forums, including blog posts or diaries with screenshots of their experiences in the forest, short stories and backstories about their avatars, fan art, and planned events and get-togethers in The Forest. Anyway, for the Halloween event, deer from all over met at a certain place in The Forest and walked around on a predetermined path for about an hour, gallantly displaying their Halloween coats, masks, and candles. It was something fun to do on otherwise quiet Halloween night, and it allowed me to access the “Candle” antler skin I remembered wanting when I first played the game many years ago. The Forest Spirit in Princess Mononoke (1999). I recently reinstalled The Endless Forest on my laptop and played around with the game for about an hour or so in preparation for this article. After resetting the game a few times to get the settings right, I spent sometime wandering around the forest, interacting with the thirty or so other people who were in the game. I still had the “Candle” antlers from the last time I logged in, as well as a pretty “Real Deer” coat. But I was missing a mask, so I interacted with a little fawn and eventually got the “Venetian Carnival” mask. My favorite mask in the game is the “Forest Spirit” mask, which looks just like the Forest Spirit from Princess Mononoke. When I used to play in The Forest, I would leave it open on my computer when I was away from my keyboard, and when I’d return, I’d be surprised with how my avatar had changed. Other deer can wander over to my sleeping stag and cast random forest magic on my avatar while he’s asleep, so it was always fun to see how he had changed in my absence. Perhaps I will do this again. Playing The Endless Forest has really brought me back about five years of so. It has made me feel nostalgic and has made me want to frolic in a real forest. Be sure to check it out and Tale of Tales’ other games on their website.